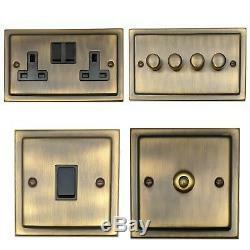 Trimline Antique Bronze TABB Light Switches, Plug Sockets, Dimmers, Cooker, TV. Please select the item you require from the drop-down menu. The price and image will then change to reflect your choice. This listing is part of the G&H Trimline Plate range. This style is a square plate with a square raised centre. Plates are slightly larger than standard plates which is beneficial when covering up marks surrounding an old switch (screw holes are the same distance apart so they still fit into regular wall boxes). The plate is made from brass and then air dry lacquered to achieve the antique effect (the process used for antique finishes means that the colour of the finish can vary slightly from switch to switch). Inserts are black and on/off switches are black plastic. Each of our variation listings feature a different insert type (inserts are black and on/off switches can be either plastic or metal). Please see our other listings for the complete range. Trimline Antique Bronze Black Inserts Plastic Switches: Item No. 302014953428 Trimline Antique Bronze Black Inserts Metal Switches: Item No. All G&H plates are manufactured to the highest standard from solid brass or steel and are covered by a 1 year guarantee. All plates come supplied with two screws coloured to suit the plate. We supply the complete range so if you cant find a matching item please send us a message. If you have a list of your requirements please message us and we will reply with a quote. Rocker Light Switches: Plate size: 95mm x 95mm (1 gang, 2 gang & 3 gang) Plate size: 155mm x 95mm (4 gang) Use as 1 or 2 way (1 gang intermediate also available) Required back box depth: 25mm or deeper Rated Amps: 10A. Toggle Light Switches: Plate size: 95mm x 95mm (1 gang & 2 gang) Plate size: 155mm x 95mm (3 gang & 4 gang) Use as 1 or 2 way (1 gang intermediate also available) Required back box depth: 25mm or deeper Rated Amps: 10A. Single & Double Plug Sockets: Plate size: 95mm x 95mm (single) Plate size: 155mm x 95mm (double) Required back box depth: 25mm or deeper (recommend 35mm unless box is sunk into wall) Rated Amps: 13A DP. Dimmer Switches Rotary: Push on/off and turn to dim. Plate size: 95mm x 95mm (1 gang & 2 gang) Plate size: 155mm x 95mm (3 gang & 4 gang) Required back box depth: 35mm or deeper 250W: Please select 400w version as this now has a minimum load of 40w. Halogen Only 400W: 40w minimum load, 400w maximum load. Halogen Only 700W: 150w minimum load, 700w maximum load. Halogen Only LED: 5w minimum load, 250w maximum load. Leading edge dimmer Use as 1 or 2 way (2 way only with an on/off switch). 20 Amp Switches: Plate size: 95mm x 95mm Required back box depth: 25mm or deeper Rated Amps: 20A DP (Double Pole). 45 Amp Switches: Plate size: 95mm x 95mm (single) Plate size: 155mm x 95mm (double with 13A socket) Required back box depth: 35mm or deeper Rated Amps: 45A DP (Double Pole). Shaver Sockets: Plate size: 155mm x 95mm Required back box depth: 47mm Rated Voltage: 115V240V AC. 5 Amp Sockets: Plate size: 95mm x 95mm Required back box depth: 25mm or deeper Rated Amps: 5A. TV, Satellite, RJ45, BT, Fuse & Fan Isolator Sockets: Plate size: 95mm x 95mm Required back box depth: 25mm or deeper. Blank Plates: Plate size: 95mm x 95mm (single) Plate size: 155mm x 95mm (double) Required back box depth: 16mm or deeper. All prices include VAT (VAT receipt can be sent on request). Damaged or Faulty Goods We aim to provide the highest level of service to our customers. Please note, we will only send out a replacement item on receipt of the faulty/damaged item. Returning Unwanted Goods We value our customers greatly and aim to provide the highest possible level of service. Every effort will be made to deliver the goods as soon as possible after your order has been paid for. Where possible we will always send a replacement part rather than change the whole item as this allows us to resolve the issue immediately. We will action all problems as quickly as possible, we pride ourselves on our customer service, both pre-sale and post-sale. The item "Trimline Antique Bronze TABB Light Switches, Plug Sockets, Dimmers, Cooker, TV" is in sale since Friday, July 15, 2016. This item is in the category "Home, Furniture & DIY\DIY Materials\Electrical Fittings". The seller is "ashdownhomestore" and is located in Crawley.